A carrier-grade network for aggregators. 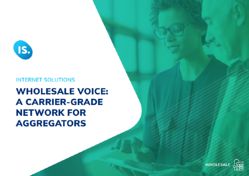 Wholesale Voice offers access to a carrier-grade network that delivers exceptional quality to your customers and real value to your business. Whether you’re an established player or a new entrant that’s waiting for licences and numbers, you can contain costs and maximise margins with our Wholesale Voice services. Far more cost-effective than conventional fixed line and mobile voice options.